On 8 January, Son Yambu will banish the post-Christmas blues with red hot rhythms straight from the streets of Eastern Cuba. Son Yambu bring a sensational, authentic Latin-music experience that turns any event into a fiesta. A free salsa lesson at 7pm for gig-goers means that everyone can join in the fun! Comedy starlet Katherine Ryan will light up the January gloom on 14 January, with her razor sharp and hilariously funny new show, 'Kathbum'. Fellow Canadian, Stewart Francis will call in at The Apex on 24 February; his new show, 'Pun Gent' will be packed to the gills with his usual dry one-liners. More comedy comes from Rob Beckett, the ‘Mouth of the South’, on 3 March, and Russell Kane is the ‘Right Man, Wrong Age’ on 25 March. One of the biggest bands of the Two-Tone movement, The Beat return on 29 January. With hits such as ‘Mirror in the Bathroom’, ‘Too Nice To Talk To’, ‘Hands off She's Mine’ and ‘All Out To Get You’, The Beat provided some of the catchiest songs of the 1980s. Today, Ranking Roger and his son provide an energetic, upbeat show, guaranteed to get you up and skanking! Folk gigs include Oysters 3 on 21 January - the three founder members of folk-rock legends Oysterband in an evening of acoustic performance and stories. Fairport Convention return on 12 February, while Gordie MacKeeman & His Rhythm Boys play energetic old-time roots music on 26 February. Otava Yo bring the abandoned traditions of Russian folksong to life on 6 March and the first all-female folk band, The Poozies play here on 15 March. The Echoes Of Ellington Jazz Orchestra play 'The Duke's Greatest Hits' in It Don't Mean A Thing (If It Ain't Got That Swing) on 24 January, while the legendary Jack Jones, celebrates 100 years of Frank Sinatra with music and chat on 31 January. Songbook Sundays returns on 31 January and features The Chris Ingham Quartet with guest singer Sara Dowling, it continues on the 3rd Sunday of every month with more special guests from the world of jazz. The Chicago Blues Brothers all-live revue on 23 January is packed with the best Blues, Motown and Soul from both Blues Brothers movies, plus classics from James Brown, Ray Charles, Aretha Franklin, Otis Reading and many more. Hit songs are also guaranteed at: Nearly Dan, on 30 January, who promise all the Steely Dan favourites; the 60s Hits and Laughter Show 2 on 7 February with The Merseybeats and The Fortunes; Barry Steele’s The Orbison Story on 19 February, and a night of disco and funk from Black Box, Shakatak, Angie Brown and Natasha Watts in Boogie Night 5 on 27 February. The Dire Straits Experience on 5 March features former Dire Straits members Chris White, Chris Witten and Terence Reis, who replaced Mark Knopfler on the Dire Straits tours from 2011-2014. Enjoy an afternoon with Anita Harris on 7 February, with songs such as ‘Memory’, ‘All That Jazz’ and ‘Route 66’ and humorous anecdotes from Anita's life in show business. Lulu’s date on the 2 March has sold out, but tickets are still available for her return visit on 24 March. Howard Jones will play a rare acoustic show on 21 February - giving the audience an insight into his 30 year music career as he reveals the inspiration behind hits such as ‘New Song’, ‘What is Love?’ and 'Like To Know You Well’. Voted ‘Female Vocalist of the Year’ at the 2015 British Blues Awards, Jo Harman was described by The Daily Mirror as "the finest female soul blues singer in the UK"; her soul-fuelled songs on 25 February will range from hard driven rock to heart warming ballads. March sees five very different jazz gigs: on 1 March, the National Youth Jazz Orchestra will play established big band classics and new commissions, while on 8 March, Tord Gustavsen creates beautiful interpretations of ancient Norwegian hymns. Always original and inventive, Barb Jungr puts her inimitable spin on material by artists as disparate as Dylan, Springsteen and Sondheim on 17 March. Acclaimed vintage swing-pop group The Puppini Sisters play on 14 March, while Hot Club of Cowtown return on 30 March, with an exuberant programme of Gypsy jazz and Parisian swing. If you’re looking for Christmas gift inspiration, how about Apex event tickets or gift vouchers – the perfect present for the music or comedy lover in your life! 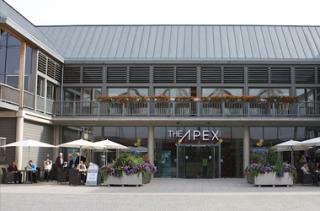 See www.theapex.co.uk or ring 01284 758000 for more information, or to book.